A good deck is the centerpiece of how your family has fun and entertains outdoors. Whether that looks like burgers on the grill or evening glasses of wine with friends, your deck makes those summer moments so much better. To keep enjoying those magic outdoor moments, your deck will need some maintenance and repairs from time-to-time. Restoring your wooden deck is a popular choice for most homes as it saves serious money and allows you to keep the deck where you made so many memories. At Eby Exteriors, we’re all about teaching homeowners what they need to know — and ensuring that everyone gets to experience the fun of outdoor living. Whether you want to attempt the project on your own or work with a local deck repair company, it all starts by knowing what’s good, what’s bad, and what’s unsafe. Check out our DIY deck inspection guide, and start planning your deck restoration. This deck inspection guide is just the first step in helping you get the outdoor space you’ve always dreamt about. When inspecting your deck, you’re going to check it out from top-to-bottom. You need to make sure that your deck frame is solid enough to work with and where you’re going to spend your restoration budget. If your deck foundation isn’t solid, you’re going to need to replace it rather than repair it. 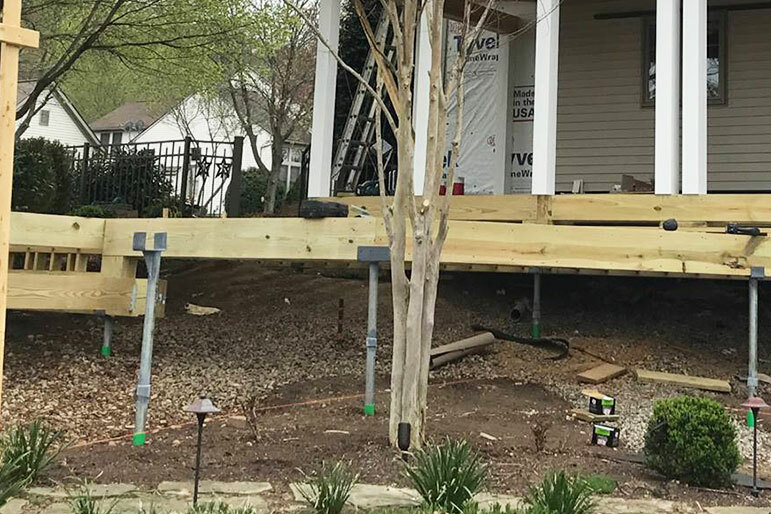 A bad foundation can put the ENTIRE project in jeopardy — that’s why we start our DIY deck inspection guide with the foundation. Obvious Base Rot — Look for rot around the base on the wooden posts. If your wooden foundation is in the ground, eventually it WILL rot. Underground Rot — Dig a few inches down around the post. It’s somewhat common to see posts that look fine above ground but are rotten below. Soft Posts — If the wood at the bottom of the foundation feels soft, that’s also a sign of rot underneath. Swaying or Movement — Push on the posts themselves. If you see significant movement, it’s a sign your deck structure is less than sound. Ponding Water — Look for ponding water around your posts after a rainstorm. Ponding water accelerates how quickly wooden posts will rot. If your foundation is damaged, contact us ASAP. Getting to the rot or damage early increases the chances we can save your deck frame. Since direct contact between the ground and the foundation causes rot, we build deck foundations with no wood in contact with the ground. When building deck foundations, we install the wooden deck posts above ground on concrete footings or employ advanced techno metal posts instead of wood. Another important aspect of deck safety, the deck structure is no place to cut corners. The deck structure includes everything that makes up the deck surface you stand on, including the beams, joists, and the stairs (if you have them). Cracking and Rot — Stand under your deck with a flashlight and look for obvious signs of cracking and rot. If the damage is obvious enough that you can see it from far away, you’ll likely need to totally replace your deck. The Feel Test — Feel the deck surface. Your deck surface should feel rock solid. If the wooden surface feels soft or saggy, the deck isn’t safe and will require some serious work. Shaking — If your deck or the stairs are shaking or wobbling, that’s a sign the structure is giving out. In some cases, we’ve even seen old wooden decks completely separate from the house they’re attached to. Squeaking — We’re not kidding: listen for squeaking as you walk across your deck — it can be a sign of damage to the deck boards or structure. Examining your deck structure is one of the most important parts of our deck inspection guide. After all, if your deck is shaking and wobbling, it won’t be your outdoor relaxation oasis. 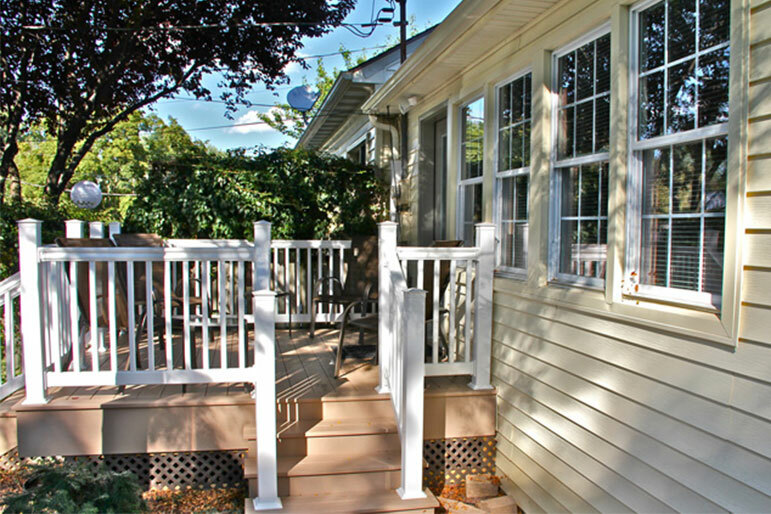 When we replace the structural work on your deck, we upgrade it. That way you can get a few decades out of your deck this time around. 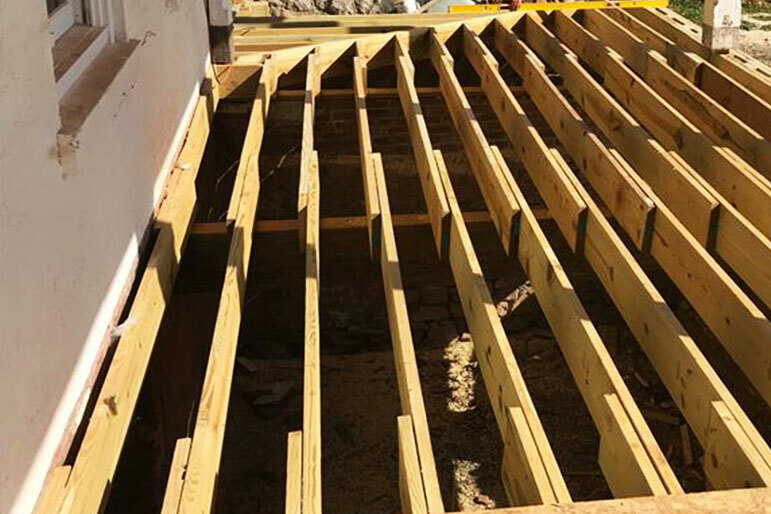 When upgrading old wooden decks, the Eby Exteriors team builds a stronger structure by installing larger, sturdier beams and placing joists closer together for extra durability. Your deck surface is likely what brought you to this DIY deck inspection guide in the first place. A lot of different things can go wrong with the surface — and a beat-up surface tends to get attention for all of the wrong reasons. These signs typically apply to traditional wooden decks. Splintering — If your wooden deck boards are splintering, they’ll need to be replaced. Deck splinters tend to be extremely large and can hurt children’s hands and feet. Nails and Screws Popping Up — If your nails and screws are pushing through the deck boards, it’s a sure sign that they should be replaced. Warping of Deck Boards — After spending years baking in the sun, wooden deck boards can warp or bow. The only thing to do here is to replace them. Gapping — Another thing to include in your DIY deck inspection, gapping between deck boards can appear over time. Grayish or Discolored Deck Boards — Your deck boards started out as a gorgeous shade of mahogany or onyx, but now they’re gray driftwood. Not a look you like. 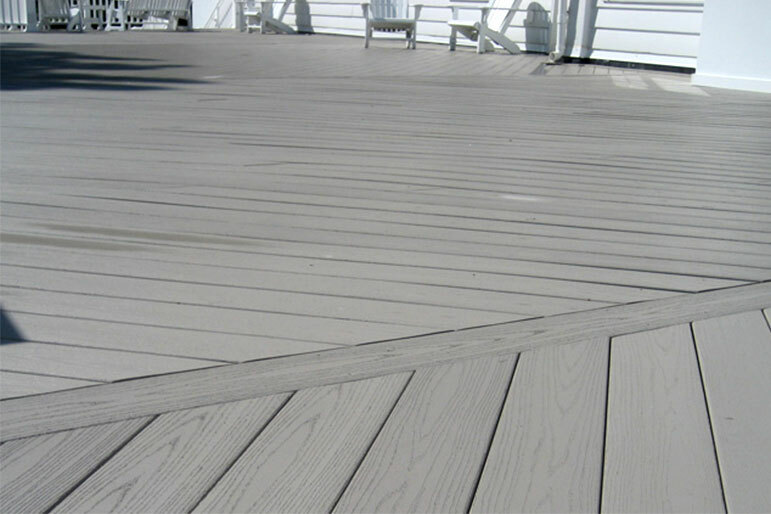 As wooden deck boards get old, they lose their color — no matter how many times you try to repaint or re-stain them. If that describes your deck, it’s time to upgrade. Mold and Mildew — Mold and mildew can grow out-of-control on wooden decks, eventually destroying them. If you see mold, you need to do something about it. If your deck mold problem isn’t too widespread, you can handle it yourself. Power wash the mold right off the deck surface and then wash it with a bleach-based cleaner. However, if your deck boards have seen better days, there’s not a lot you can do. We recommend restoring your deck surface by replacing the old boards with brand new wooden or low-maintenance composite options. Any deck taller than two feet off the ground is required to have a railing system, so we included it in our deck inspection guide. Not only is your railing system a safety feature, but it can be a key stylistic point, too. Cracking Damage — The only real clue to look for, if your wooden railings are showing cracks, you’ll likely need to replace them. Could they Hold Your Weight Anymore? — If your railing system feels weak, it probably is. Add built-in lighting to your rail to cast a gorgeous perimeter glow around your deck. Accessorize with drink rails and have the best seat at the bar in your own backyard. 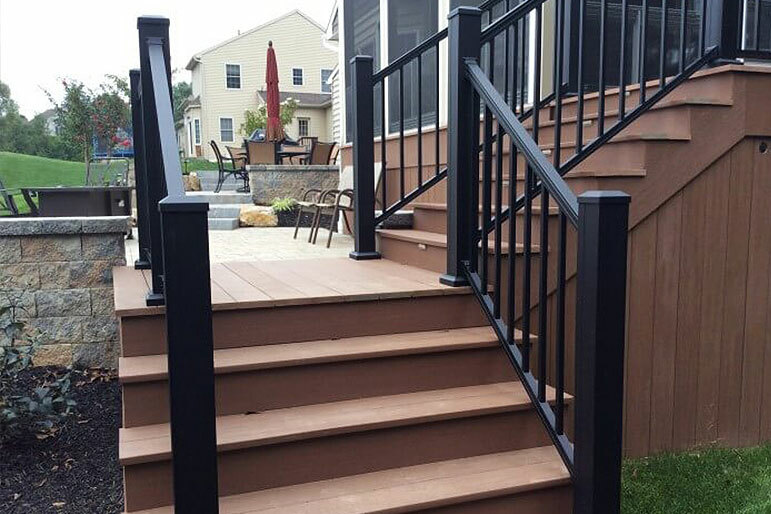 Upgrade to an ultra-stylish and durable railing material like composite or aluminum. Whether you want an expert set of eyes to inspect your deck or you want to discuss your deck restoration, we’re the team to help. If you’re planning to build something fresh or restore your deck to a better-than-new state, let us make it a reality. At Eby Exteriors, we have the reputation throughout Lancaster County and beyond as the home contractors that make your outdoor living dreams come to life. Start the conversation about your deck today!